Texas Western's SD70 nos. 8000 & 9234 stand at the head of a consist of double-stack containers. This page is a summary and description of various MSTS tools, apart from those supplied with MSTS itself. At this stage, because he's restricted by the screen resolution of his monitor, webWiz can't run various development tools, such as the Route and Activity Editors. Have no fear, they'll be discussed in the near future! Once the Dash 9 led freight passes, we can get our TW SD70s up to speed. Carlos Gomes' free consist builder, consist tester and activity tester is described in more detail on its own page. As of 17-Mar-02, ConBuilder is now at version 1.4.9, having had some additional features added. We carefully guide our TW SD70s across the Cutbank bridge. This free tool enables you to change the starting time and weather conditions of an activity. Changing from a clear summer day to winter snow can make quite a difference to driving a heavy freight across Marias Pass! There are a couple of new features in version 1.1. Firstly, you can view the player's timetable. You can change these times, but you have to do it manually - that may be a lot of work for some activities. You can also read through the activity's brief or working orders. The activity that's changed is backed up to a separate file so you can go back to the original at a later stage if you want. As of 17-Mar-02, Activity Changer is at version 1.1 and can be downloaded from Train-Sim.com. Activity Changer is a Java application so you need the Java Runtime installed. If you install Activity Changer and run it from Start/Programs but nothing happens, you'll have to download and install the JRE from http://java.sun.com/j2se/1.3/jre/download-windows.html. Amtrak often add mail & express boxcars to their Empire Builder passenger service. RC-Lite, rc-lite.zip (23-Dec-01, 5.8Mb), is the freeware version of Route Control by http://www.howintheworld.com. Whereas the full version has a range of features, particular as the title suggests, the means to manage MSTS routes, the free version is only capable of doing a thorough check that you have all the necessary rolling stock for the consists on your system. RC-Lite is a worthwhile tool to supplement ConBuilder and may help solve any consist problems you have, especially after installing an activity since it removes an offending consist to a separate folder until you install any necessary locos and rolling stock. Mike Simpson's Route Riter helps out both route developers and those of use who download and install free routes. In MSTS' early days, installing a free route in many cases involved copying many of the texture and shapes files from all or some of the six default routes. However, not all these files were necessary for the route but neither the route's developer nor the user had a tool to remove these unwanted files. For example, webTrainSim has just taken advantage of Route Riter to remove unused files from his installation of the free Modern England Route. The amount of disk space was halved, from just over 700Mb to approximately 300Mb. Mike has a good help system and you only need follow the procedure step by step to accomplish the task. Many route developers are now using Route Riter to our advantage (particularly in terms of the download size of the route across the Net) by having it check the files used from the default routes and writing a batch file which becomes part of the installation. This batch file, by default named installme.bat, knows which files are required and we run it to copy only what's required from the default routes on our hard drive. Having only a feeble dialup connection, webTrainSim decides whether or not to download a route in regard to its download file size (obviously) and checks if it's installation has been put together with the help of Route Riter so there's no wasted disk space. It's worth noting the difference between Route Control (the full version) and Route Riter. The former packs up a route and puts it away until you want to use it. On the other hand, Route Riter removes unnecessary files and the route is always available on which to run your trains. 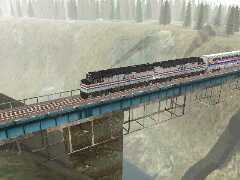 MSTS fans on a special excursion led by Amtrak F40s get a spectacular view outside Java on the Marias Pass. To get as much realism (prototypical performance is the equivalent description you'll come across) as possible into MSTS, the various parameters (horsepower, friction, braking force, and so on) that describe a locomotive or item of rolling stock should be the values of the locomotive or rolling stock in real life. These values can be found from manuals or manufacturer's web sites. To make the changes in the locomotive ENGine files or rolling stock WAGon files is a touch more difficult, especially in WordPad where you'll have to scroll your way through the file to find the value to change. ENG Changer is a small program that locates the necessary ENG and/or WAG files for you and brings up a list of values that can be changed. Enter the new value, click the Change button and the file is updated. Before changing any values in an ENG or WAG file, you should do some backup reading to ensure you know the significance of any parameters you change, particularly those dealing with friction, brakes, air brake recharge time, tractive effort and coupling forces. As well, note that because MSTS was developed in the U.K. by Kuju, there is somewhat of a mixture of metric and non-metric units used for values. If you need to make conversions, download mstsconv.zip from Train-Sim.com. Inside ENG and WAG files, one of the TechDocs in compressed format on CD1 of the MSTS installation CDs (you'll have to manually copy Techdocs.exe from CD1 to a folder on your hard drive; make a subfolder under My Documents named MSTS Tech Docs to keep all such docs in one place; either run Techdocs.exe to extract all the documents or access it with WinZip as the need arises. 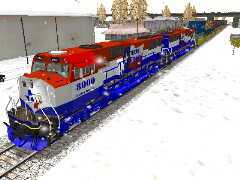 Scott Borchardt's locophy3.zip and sdphy41.zip from the Train-Sim.com files library. A team of Union Pacifc AC6000s grind up the grade at Java, the steepest section on Marias Pass. Al Krug's free program (www.vcn.com/~alkrug/)calculates tractive forces, given various real-world parameters such as track grade, weight of loco, horsepower, and so on. You'll see references to this program in Scott Borchardt's work, particularly his Loco Power Table in locophy3.zip.